38 stained glass designs for ornaments, magnets wall sconces, napkin rings, wreaths, sucnatchers, and Christmas trees. 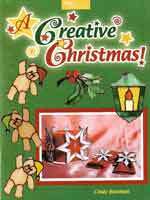 This book offers unique holiday decorations and contains charming holiday stained glass pieces crafted with the lead-wrap method. This book features a a 15 piece southwest style nativity scene & hanging and freestanding holiday angles. 34 pages black and white, 2 color pages of finished projects. Festive designs for cheery Christmas gifts and decor. Eleven projects including Santa, bells, ornaments, a church and a three-dimensional angel. Fold-outs in duplicate. The 30 or more projects in this book are on fold-out sheets so that there is a wider size variety than found in some pattern books. Nativity figures abound, as do angels, hearts and flowers. One of the distinctive suggestions given is for the making of a custom stained glass frame to house a wedding invitation, and several interesting patterns are found therein. The several candy dish patterns include one for St. Valentine's Day.